Over the past several years, U.S. oil producers have rushed into the Permian Basin of West Texas and Eastern New Mexico. Today, approximately half of the horizontal rigs active in the United States are drilling oil wells on Permian acreage. Looking ahead, the sustainability of Permian oil production growth is increasingly dependent on the handling of a voluminous by-product: water. As oil is harvested from the hydrocarbon-rich formations in the Permian, brackish water is produced. This water comes to surface with very high salinity levels, and various ions and chemicals. This is wastewater that cannot be economically made potable, and the quantities are staggering. In the western part of the region, water cuts can average three to five barrels of water produced to each barrel of oil. 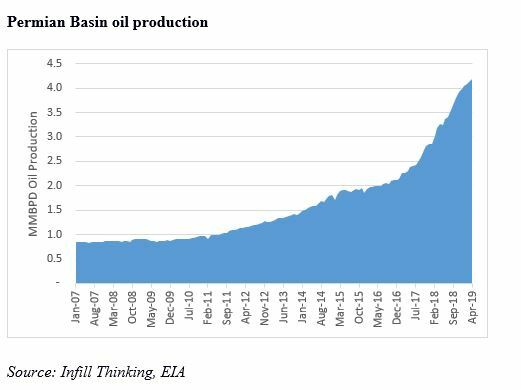 When oil production is growing at the pace the chart below shows… well, that’s a lot of associated wastewater that must be handled and disposed of. Infill Thinking estimates that Permian Basin oil wells will produce enough wastewater to fill about 900 Olympic-size swimming pools. By the early-2020s, that figure could approach 1,800 swimming pools filled… each day… every day. The traditional methods of coping with this wastewater are being stressed now and will soon be overwhelmed if they aren’t rapidly modernized. Oilfield water production is commonly moved by water truck to salt water disposal wells where it is pumped down and disposed of deep in the earth. But the coming wall of water production will be too vast to move by truck. Thus, many hundreds of miles of pipeline need to be laid. Meanwhile, the in-place disposal well network is likely to be overwhelmed too. Seismic activity in the Western Permian Basin is already on the rise as the millions of barrels being disposed are pressurizing geologic formations. Texas regulators will inevitably start cracking down on injection rates in drilling hotspots in the near future to curb the quakes. If nothing is done to expand and modernize water handling capacity, oil production in the Permian will be forced to slow down – oil will become constrained by water. So what is the answer? To solve this increasingly urgent problem, the oil industry is changing its practices and business models. For one thing, the industry is recycling more of this produced water than ever before, reusing it at the front end of oilfield extraction. Hydraulic fracturing requires a lot of make-up water, which has historically come from groundwater suppliers, but is now being sourced to a growing degree from treated wastewater byproduct. 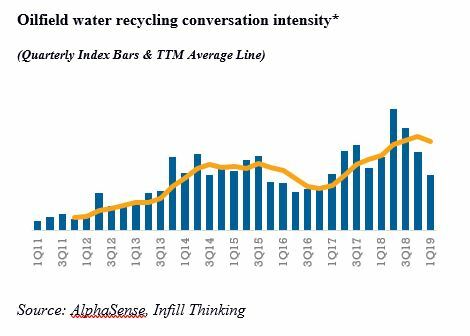 We used AlphaSense to listen in on the oilfield water recycling conversation, tracking the industry’s sense of urgency to recycle oilfield wastewater. Interest in reuse surged in 2017-2018, as many oil producers began investing heavily in water recycling facilities. Today, those investments are paying off in the form of reduced reliance on freshwater. Furthermore, many public oil producers are now evaluating spinning off their water management businesses into standalone entities. Third-party water management can create scale and flexibility through shared infrastructure. This is an emerging trend that we expect to transform what was once a cottage industry within oil producer umbrellas into a new standalone midstream sector over the next three to five years. AlphaSense’s smart search functionality comes in handy for keeping up with this business model evolution, empowering us to scour thousands of public oil company documents in order to quickly triangulate on which companies are taking action to transform how they approach oilfield water. - PDC Energy executive on recent conference call. (Log into AlphaSense to view source here). - Rosehill Resource executive on a recent conference call. (Log into AlphaSense to view source here). Private equity dollars are flooding into this space, backing management teams and assets attempting to solve this colossal problem (case-in-point is Goodnight Midstream’s $1.2bn recapitalization). With an expanding universe of large, sophisticated, fast-growing, privately-held oilfield water management companies now active in this space, we expect to see some oilfield water IPO action over next couple of years. Necessity is the mother of invention, and necessity has set oilfield water management on a course of reinvention, modernization, and rapid change. Intelligently monitoring the conversation in this once overlooked oilfield niche is increasingly important for all Permian Basin stakeholders. Joseph Triepke is Founder and Principal Research Analyst at InfillThinking.com, an oilfield market information firm. Previously, he was a publishing sellside analyst and a buyside analyst working on oilfield service names for firms including Citadel, Guggenheim, and Jefferies. He majored in finance at the University of Texas at Austin.